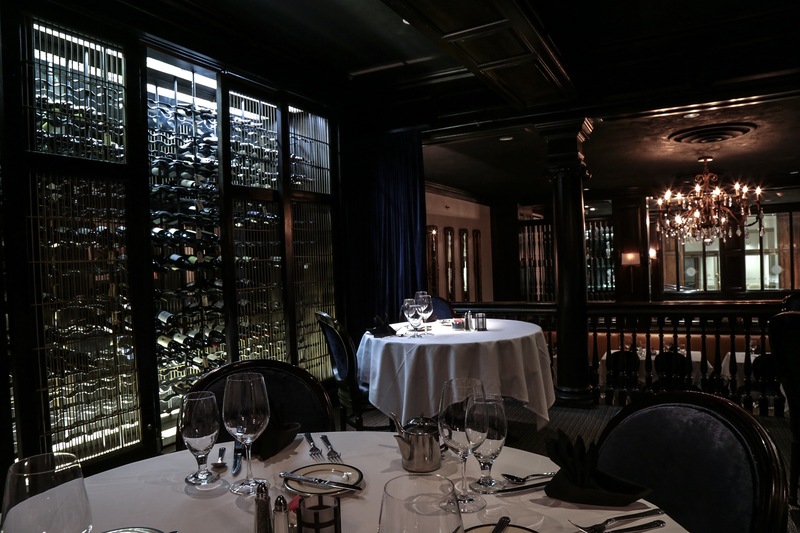 The Tenderloin Room is an independent, family-owned restaurant in the middle of the Chase Park Plaza Hotel in St. Louis. It has that old-style city steakhouse feel: dark wood, dim lights, white linens, and an overly-aggressive waiter in a tuxedo scooping your breadcrumbs off the tablecloth every three minutes. My girlfriend treated me to dinner there for my birthday. It was certainly an experience. First impressions: Knowing that there is still a dress code, even if it is “business casual”, is refreshing these days. So many places just say “come as you are”, that having to put on a collared shirt for dinner made it a step up, which enhanced the sensation that this was something special. And as we walked in and took in the dark wood paneling that’s been there since the beginning in the 1940s, the soft lighting, and the wall of wine accented by the stained glass above the bar, it really felt a step up. Settling in: Our waiter was Mick, a New York-sounding gentleman who we learned is actually a St. Louis native. He was professional, well-attired in his tuxedo, and competent at what he was doing. However, I felt like he was either in a hurry or somewhat dismissive at times. He would not quite finish his sentence before turning to move along. This was the only negative from his otherwise high-quality demeanor. The food: We chose not to have wine or cocktails, nor any of the appetizers. Mick presented them well, with full knowledge of each option and a great style. However, we really just wanted the steak, so we chose not to indulge. She had the Cowboy Ribeye. I chose the Pepperloin a la Tenderloin, their signature preparation of filet. Both came with mashed potatoes and a steamed broccoli bunch. The steaks were well-seasoned and quite tasty. However, I believe they were slightly undercooked. She ordered medium-rare, and it was plated more like rare. I ordered medium, and mine came out more like medium-rare. Not a bother, as we both would rather have it less done than more. The steaks were very good, but not out of line with any other fine steakhouse dinner I’ve had before. It’s hard to mess up broccoli, and they didn’t. We both agreed the best part of the meal, though, was the mashed potatoes. I believe they were red potatoes, twice-baked, and there was some skin left. In combination with copious garlic and seasoning, this portion of the meal made an impression on the both of us. We felt that the potatoes were far above anything comparable; and that’s what really set this dinner apart. Full by that point, we couldn’t even take a look at the dessert presentation. Perhaps another time when we have a bit more room. The $$$: It’s a steakhouse, and it’s inside the Chase Park Plaza hotel, so it’s going to be on the expensive side. However, I received this dinner as a treat, so I didn’t have to pay! From the menu prices, though, I suspect that the meals are on the high end of reasonable. Overall rating: While the evening was excellent, I give the Tenderloin Room 4 stars out of 5. The food was top-notch; the host, as I said, was just below that with his attitude. I would have only been able to rate the Tenderloin Room 5 stars had we gotten our steaks cooked more to our request. Otherwise, I heartily recommend it for a special evening.